Posted on Thu, Mar 1, 2012 : 11:07 p.m.
Huron's Grant Strickler, left, battles Ypsilanti's senior Mamadou Ba and Lavonte Davis for a rebound during an SEC crossover game at Huron on Thursday night. 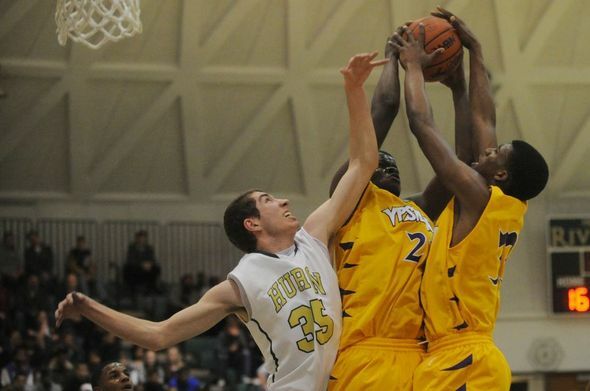 Ypsilanti's size advantage was a key in its 55-50 win. It looked like a playoff game. Two division winners pushing the pace as each seemed to have one more run in them to win the game. It sounded like a playoff game. Two rival crowds and cheerleaders going head-to-head as the noise got louder down the stretch with each subsequent basket. It ended like a playoff game, coming down to a few crucial shots in the final minutes and a couple of clutch free throws. But the Ypsilanti High School boys basketball team's 55-50 victory over Huron wasn’t a playoff game. It was just the final regular season game as the Southeastern Conference division winners met in a crossover game. Trailing heading into the fourth, Brooks’ team went on an 8-1 run in the opening 4 minutes of the quarter to take a lead they would hold the rest of the way. But it wasn’t easy. A 3-pointer from Huron’s Andre Bond with just over 3 minutes left cut the Phoenix lead to two. Huron would miss two game-tying free throw attempts and then a fadeaway jumper as the game headed into the final minute. A strip gave Huron the ball back, but Bond’s 3-pointer from the corner clanged off the rim with a half minute to go. “If they hit the shot contested, I can live with that,” Brooks said. The River Rats didn’t and Ypsilanti grabbed the rebound and calmly hit two free throws. Huron scored a quick basket to bring the game back within two with just 17.5 seconds left and got a quick foul. Ypsilanti’s Marcus Palmer, who had missed a layup in the preceding minutes, hit two more free throws to ice the game. Yet early, Ypsilanti was anything but calm. From the opening tip, the Phoenix were affected by the playoff-like atmosphere. Huron jumped out to a 7-0 lead in the opening minute and held the lead heading into the second quarter. Tristan Simmons would finish with 15 points, one behind teammate Mamadou Ba and Bond for the game high, but scored just two points in the first. Simmons and the rest of the team calmed down by the second. The point guard opened the quarter with a 3-pointer and added two more as the Phoenix outscored Huron 13-2 in the second quarter. Eventually, Ypsilanti’s size advantage, which had disrupted Huron’s offense all night and led to a number of easy baskets on the other end, reestablished its presence. Ba (6-foot-6), Lavonte Davis (6-foot-7) and Marcus Palmer (6-foot-6) scored six of Ypsilanti’s final 13 points and six more came from from 6-foot-3 guard Derrick Richardson. Huron has just one player over 6-foot-3. The good news for Huron is that, unlike a playoff loss, this one allows the River Rats to play another game. They’ll play Skyline in the first round of Class A districts on Monday. With a bye, Ypsilanti won’t play again until it meets the winner of Saline and Lincoln in its own Class A district semifinals on Wednesday. Fri, Mar 2, 2012 : 6:16 p.m.
One of the best high school games I saw all year. Good players, good coaches, play off intensity. both of these teams can make a run in the playoffs.